Ofcom has published their annual study of fixed line home broadband ISP speeds across the United Kingdom, which reveals that the average download rate has risen from 36.2Mbps last year to 46.2Mbps now, while uploads hit 6.2Mbps (up from 4.3Mbps). Sadly the gap between urban and rural areas persists. As usual the data for this report was gathered during November 2017 via specially modified routers from SamKnows, which were installed in around 4,861 homes across the UK. The limited sample size, despite coming from a very accurate means of testing, is a hindrance and thus the study is only really useful for reflecting the performance of those who subscribe to the largest ISPs (BT, Sky Broadband, KCOM, PlusNet, TalkTalk and Virgin Media). Before we get started it’s important to put this report into some context. At present fixed line “superfast broadband” (24Mbps+) networks are available to 95% of the United Kingdom, which is mostly via hybrid fibre Cable DOCSIS (Virgin Media) or FTTC / VDSL2 (mostly Openreach) technology and a lucky few can get G.fast or “full fibre” FTTP/H. Meanwhile a little under half of the country still use the much slower and less reliable ADSL (up to 20Mbps) based pure copper lines; often despite faster connections being available (usually at extra cost). Put another way, it’s wise not to equate speedtest based studies like this to reflect the availability of faster connections as the two are far from being in sync due to the different take-up levels of slower technologies. You can see how some of these services and related package speeds perform in the real-world, at different times of day, below. Note: All sorts of things can affect service performance. For example, technologies that use copper wire (FTTC, ADSL etc.) are often negatively impacted by signal attenuation over distance. Network congestion, poor home wiring, faults and traffic management measures can also have an impact (we won’t mention slow WiFi because Ofcom’s testing is conducted directly at the router). We should point out that not everybody out there can afford, is aware of, or feels the need to upgrade to a modern “superfast” or “ultrafast” connection, even though such a service might well be available to them. However there are some areas where the availability of superfast connectivity is still a significant problem (e.g. remote rural communities and digitally disadvantaged urban pockets in the final 5% of premises). The combination of slower connectivity in the final 5% of UK premises, as well as the fact that many who could get a faster connection if they wanted but have so far chosen not to upgrade, means that there is a clear disparity of performance between urban and rural areas. 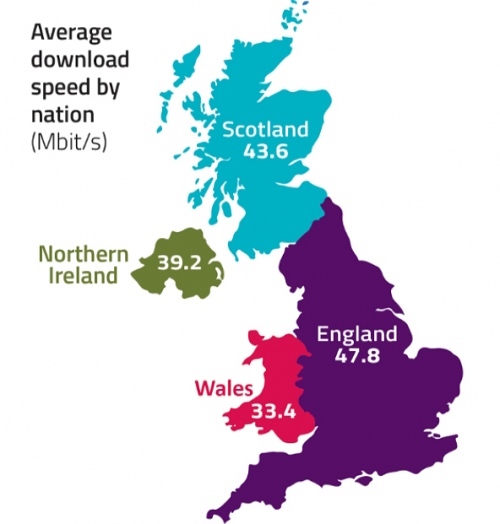 The average download in urban areas of the UK was 49.4Mbps, compared to 18.3Mbps in rural areas. 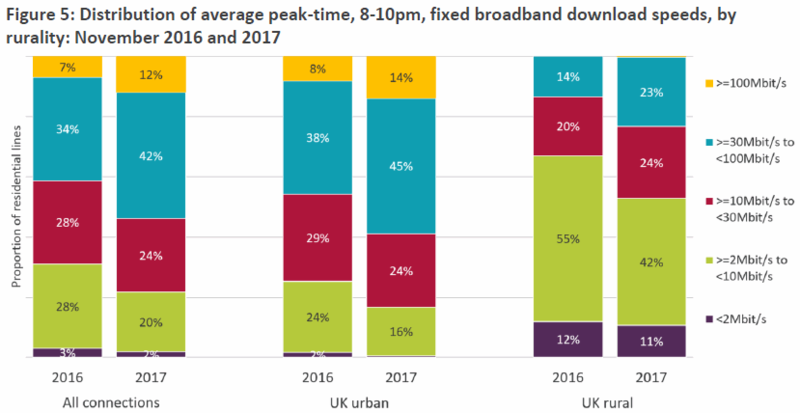 Ofcom’s analysis reveals that the effects of these differences are evident when comparing ADSL performance in urban and rural areas of the UK. For ADSL connections, the average 24-hour download speed in urban areas (10.7Mbps) was 56% higher than the 6.9Mbps average in rural areas. Some 59% of panellists in urban areas received an average 8-10pm peak-time speed of 30Mbps or higher in November 2017, compared to 23% in rural areas, while 17% received peak-time speeds of less than 10Mbps, compared to 53% in rural areas (down from 67% in 2016). England had the highest average urban and rural download speeds, at 51.3Mbps and 23.7Mbps respectively. By comparison the overall average download speed was 43.6Mbps in Scotland, while in urban and rural Scotland it was 49.6Mbps and 16.0Mbps, respectively (i.e. the lowest average rural download speed recorded among the nations). The Government have of course pledged to extend the reach of “superfast broadband” networks to cover 98% of the UK by around 2020 (here) and the new Universal Service Obligation (USO), which sets a minimum download speed of at least 10Mbps for all (here), will then aim to improve the performance for those in the final 2% upon request. Separately we should point out that the newer generation of so-called “ultrafast broadband” services are now spreading slowly across the country (Ofcom define this as 300Mbps+, while everybody else uses 100Mbps+). At present most of this stems from Virgin Media’s 350Mbps EuroDOCSIS cable network, which should cover 60% of premises by around 2019 or 2020 (see Ofcom’s Spring coverage update). In addition, Gigabit capable “full fibre” FTTP/H/B services are also on the rise (the Government are aiming for 10 million premises passed by 2022) and Openreach’s 330Mbps capable hybrid-fibre G.fast technology is expected to reach 10 million premises by 2020. But most of the work on “ultrafast” is occurring in urban areas, with only a little in rural locations due to the high costs involved (i.e. the rural vs urban speed gap will grow). 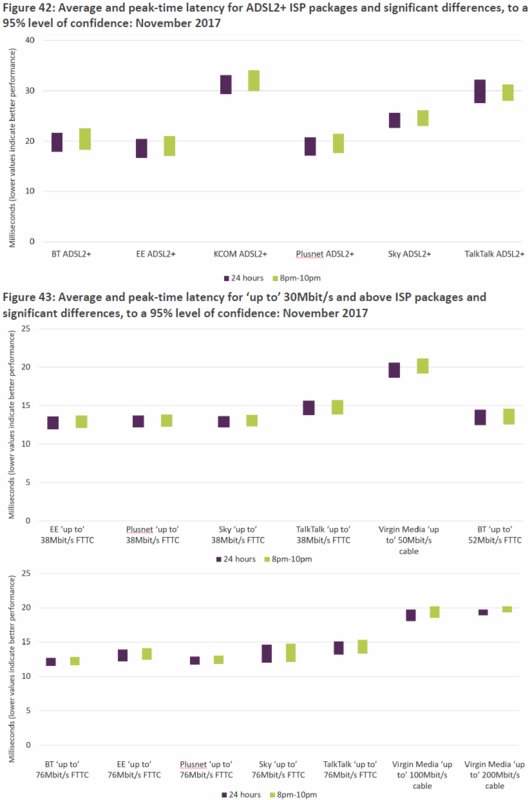 Ofcom’s study also includes a useful breakdown for the performance of specific broadband packages by different ISPs and during different periods of the day, which produces some interesting results. As usual the old copper line ADSL2+ connections (theoretically capable of up to 20-24Mbps) struggle to reach double figures, while Virgin Media’s cable network does a reasonably good job of delivering on its promised performance. Meanwhile ISPs that offer hybrid fibre FTTC (VDSL2) connections over Openreach’s network seem to do quite well with their ‘up to’ 38Mbps tiers, although consumers on the faster ‘up to’ 76Mbps packages are clearly struggling with the limitations of related copper lines. Sadly the small sample size means that we don’t get to see any results from superior FTTP/H/B based connections, while G.fast services are far too new (limited availability) in order to make it into this report. The regulator includes some results from their study of latency performance with each ISP, which is a useful measure of the time (delay in milliseconds [1000ms = 1 second]) that it takes for a single packet of data to travel from your computer to a remote server and then back again (ping). Generally a lower score (shortest time) is best for latency and this measure is especially important for fans of online multiplayer games, where a low ping can result in smoother gameplay. However these days most modern connections should deliver good latency performance, unless there’s a problem with the providers own network, your system setup or a remote internet server etc. In practical terms, there’s not a lot of difference between the ISPs and everybody should be fairly happy with the latency performance. Even the older ADSL2+ services manage to deliver 30ms or less, although there is a reasonable improvement to be found when adopting one of the faster connections (5-15ms faster). Ofcom also examined the related measure of Packet Loss (i.e. how much data goes missing during transmission, which the connection must then automatically correct); too much of this can result in higher latency. The good news is that during normal operation the ISPs displayed Packet Loss of around 0.05% to a peak of 0.4% during peak usage periods, which isn’t worth worrying about and most people will never notice its impact. Sadly there are situations where a customer’s speed may fall well below expectations and this is supported via Ofcom’s Voluntary Code of Practice for Broadband Speeds (note: a separate version exists for small business users), which requires member ISPs to provide reliable estimates of connection performance during the order process and to also help resolve related problems when they arise. The regulator is now enhancing this code (details) to supply more information during sign-up and to strengthen the right to exit when speeds fall below a guaranteed minimum level (measured at peak times). Providers will from March 2019 be given just 1 month to resolve the problem and if they fail to do so then customers can walk away penalty-free (the right to exit will also apply to contracts that include phone and TV services purchased with broadband as a bundle). Furthermore, the code has been expanded to include Cable (e.g. 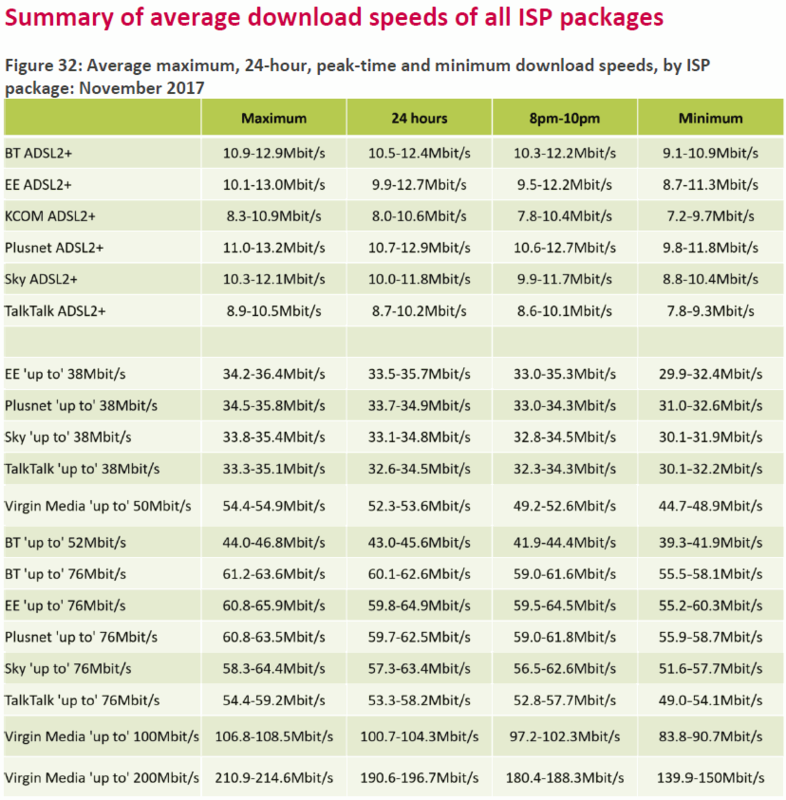 Virgin Media) and “full fibre” (FTTP/H/B) providers, although the minimum guaranteed speed level for such ISPs will be measured differently because these services aren’t as affected by the same issues as ADSL or VDSL2. Instead Ofcom proposes that the minimum guaranteed download speed should be at least 50% of the advertised speed of the package, rather than 10%. However, the code remains voluntary and many smaller ISPs find that the approach or costs involved with adapting to the rules can be too challenging, which means they don’t tend to sign-up. In particular the new requirement for ISPs to carry out speedtests in order to create a normally available speed value could be very problematic (i.e. overly complex or too expensive) for smaller operators (some wholesale suppliers are trying to help resolve this). Interesting statistics. It seems I’m at the top end of rural ADSL connections – my exchange was upgraded to ADSL2+ six months ago, and I got a welcome 70% boost, so I now get about 30% of the average speed. Regarding SamKnows, I’ve applied for a speed test router several times, but been rejected as they didn’t want any more ADSL measurements. Interesting report. Neilsen’s law predicts that the average Internet bandwidth rises by 50% year on year and the law fits data from 1983 through to the present day. This Ofcom’s findings should be interpreted as the UK falling further behind the rest of the world rather than starting to catch up. Neilsen’s law does nothing of the sort. It reflects the speed /available/ (not necessarily takeup), and deals with top-end users, not average ones. In the UK today, you’d probably be using the 200-300Mbps VM packages as the measuring point for Neilsen. Still only have a 1.8MB connection to the Internet with less usable bandwidth. Funny, BT has increased my cloud storage for being a loyal customer that I can’t even use with these speeds. If I could switch provider I would, to find something cheaper rather than locked in to a contract that I cannot afford to exit. I have waited almost 2 years to see if anything would be done and still nothing. I cannot backup my computer to Azure cloud. This is shocking for Bristol and I want something done now. Watching other places across the UK upgrade with FTTC or FTTP is beyond frustrating. You will find that most users in the UK have poor upload speeds. Therefore, for many using the cloud for full backups won’t make sense. A 50Mbps/50Mbps (download/upload) is far more useful than e.g. a 80Mbps/20Mbps. As I replied to your last post where you said the same thing. A huge amount of people are still on ADSL with FTTC & DOCSIS available, so obviously have no requirement for a higher upload speed. You ignorant that fact then, I’m sure you’ll ignore it again as it doesn’t fit your own personal thoughts. It is such a joy to see that the average speed is 46.2 meg. Here we used to have 5.5 meg but that has been reduced to 4.5 meg and BT have said that this is unlikely to change any time soon. The problem arose after the split between BT and Openreach. My ISP (BT) say they can do nothing as the lines are Openreach. Openreach tell me they can do nothing as I am not their customer. Does the study take into account BT’s ‘incompatible lines’? Please remember BT Broadband is only available on compatible telephone lines. Many are aluminium and don’t work with broadband, resulting in slower speeds for those that can get broadband through their line. Not all telephone lines work with computers. Has that been taken into consideration during the study? Probably not I feel. Your figures are inaccurate.